I love Forksville. 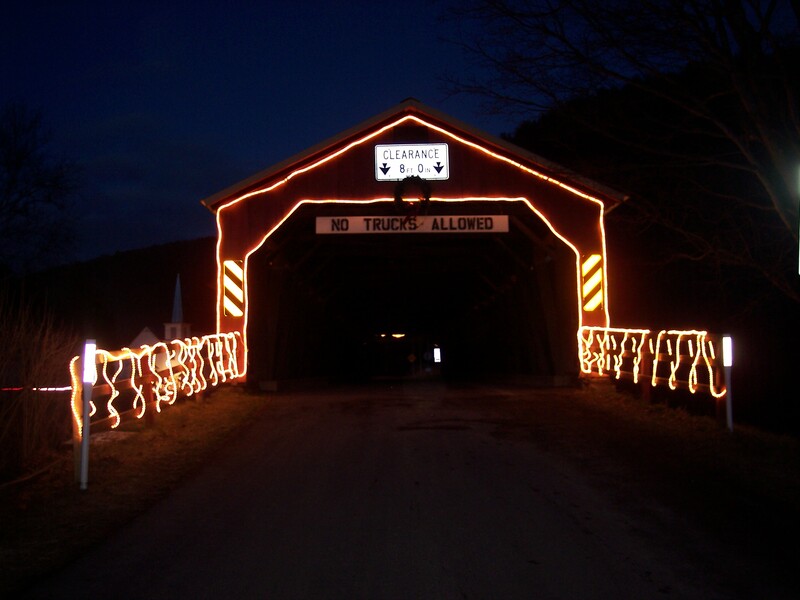 It is the most beautiful village in the Endless Mountains, nestled along the pristine Loyalsock Creek in a narrow valley surrounded by the steep slopes of the mountains and plateaus. The small village is home to not even 200 people; it has some nice Victorian homes and a covered bridge that connects the “downtown” to PA 154. 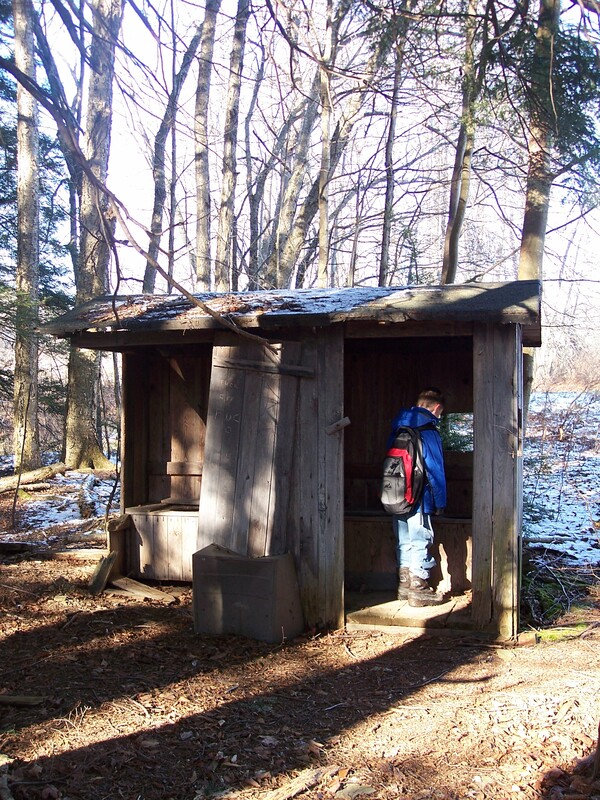 For the outdoors lover, Forksville is almost encircled by Worlds End State Park and the Loyalsock State Forest. After our hike, Leigh Ann and I went looking for a place to eat. 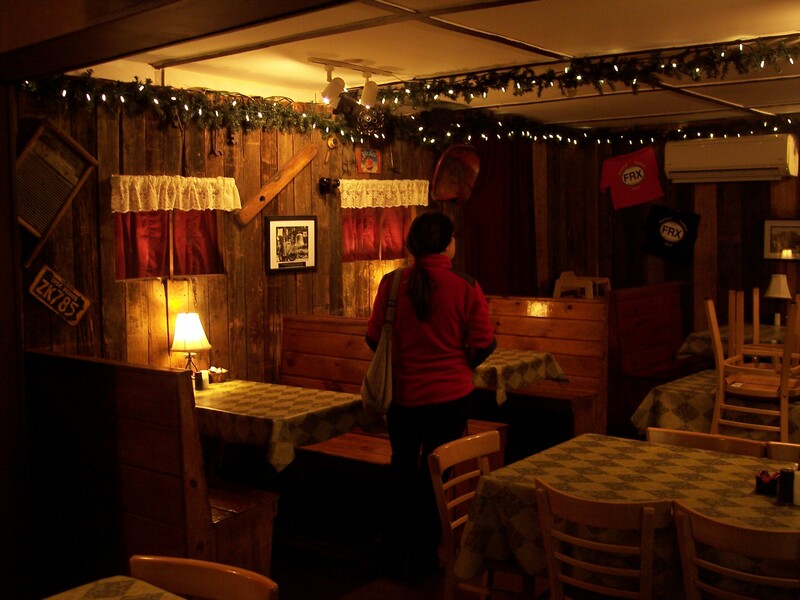 We soon settled on the Forksville General Store and Restaurant, right next to the covered bridge. We were to be the only customers, as another couple were leaving as we entered. The dining room is small, maybe the size of a large living room. If you like local flavor, this is the place to eat. The food is good, prices are cheap, and the rolls are fresh. And did I mention this small, cozy restaurant has a stage? Yes, it does. 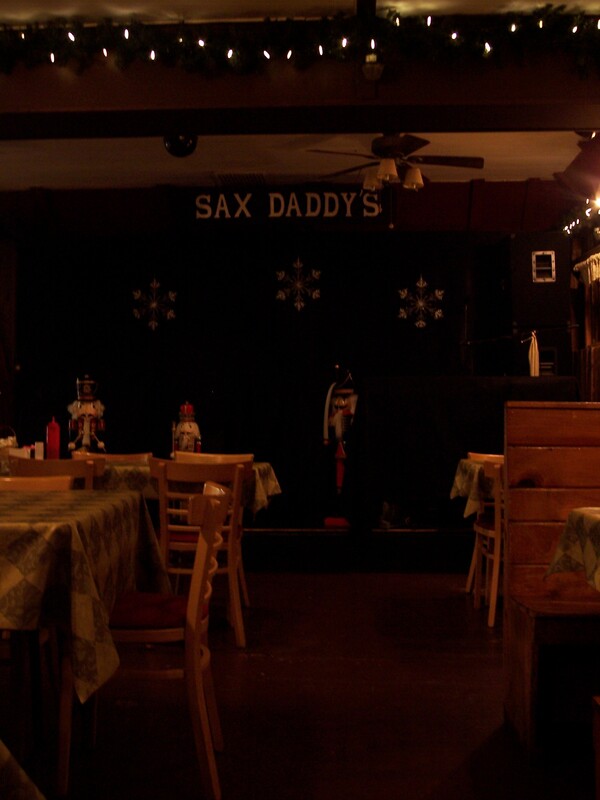 The Forksville General Store is famous for its dinner shows, where the owner and his daughter play music as you eat, but it is BYOB. It’s an experience like no other. People eating, drinking, and then the dancing begins… I went to one of these shows once, let’s just say I was happy I was staying at a cabin at Worlds End that night. 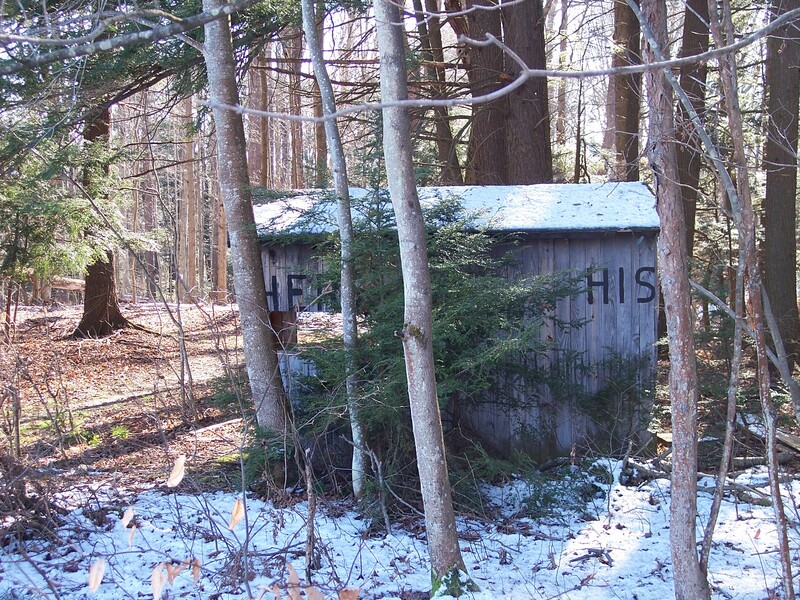 So the next time you’re in Worlds End or hiking the Loyalsock Trail, visit Forksville and the Forksville General Store. If you want some choice, I also recommend the Forksville Inn, just down the road along PA 87. Worlds End is one of my favorite state parks. 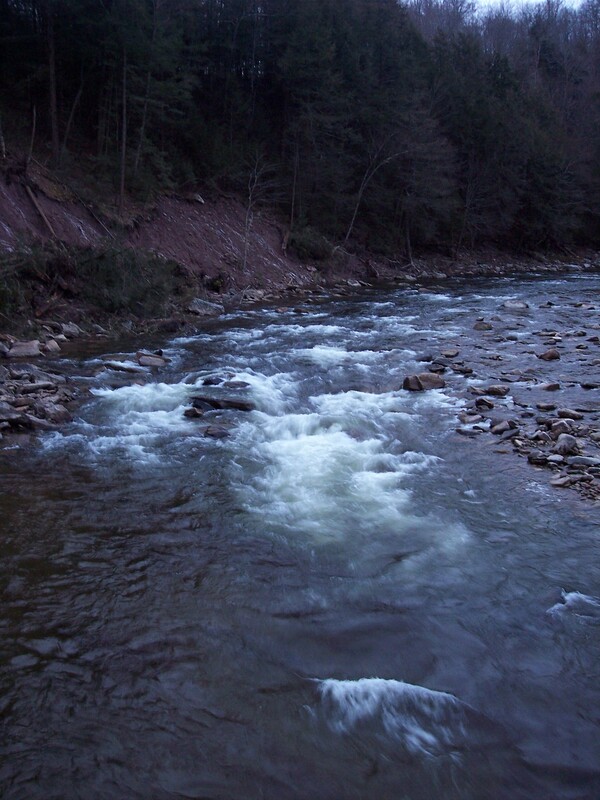 Here, the Loyalsock Creek flows through a deep canyon and nearly double backs onto itself. 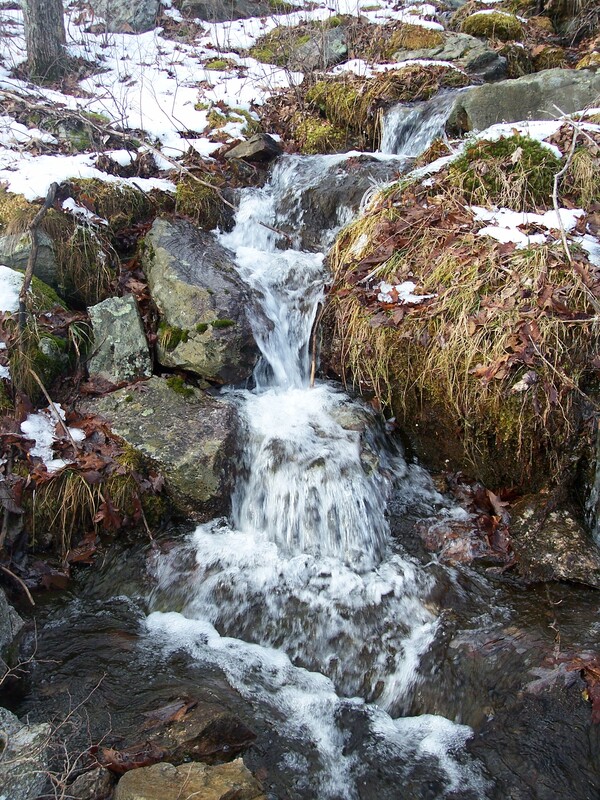 Side streams descend from the plateau through gorges with waterfalls and cascades. I’ve hiked every trail in the park. However, this weekend I hiked a brand new circuit that I found to be so enjoyable I regretted that I didn’t think to include it in the second edition of “Hiking the Endless Mountains”. This circuit begins and ends in the state park, but most of it is in the Loyalsock State Forest. 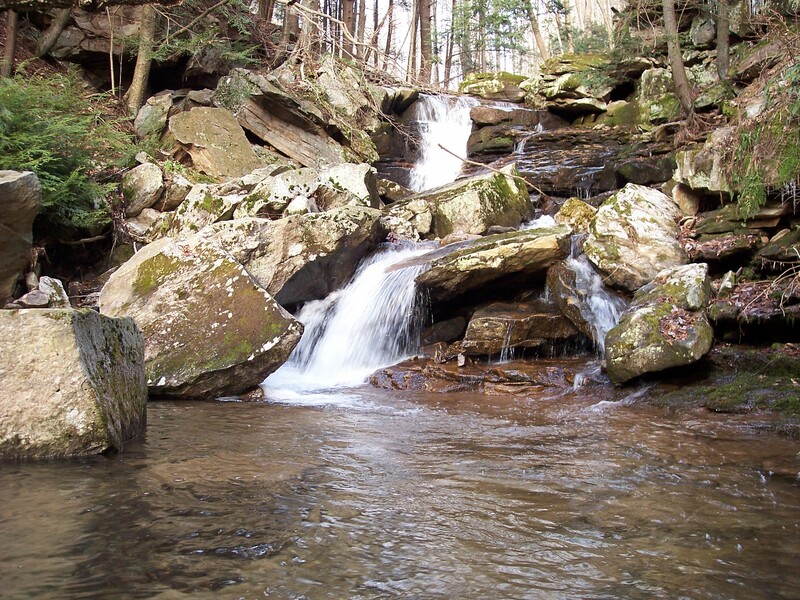 It features waterfalls, views, hemlock forests with ground pine, and beautiful streams- what more could you want? I began along the Butternut Trail and parked near the Loyalsock Creek. The damage from the catastrophic September, 2011 floods was apparent. The creek had torn around the bridge to the cabins and triggered a landslide that resulted in the ground collapsing into the creek, with crevasses and fissures where the earth heaved. Trees were strewn like matchsticks. The highwater mark appeared to be 15 to 20 feet above the creek. 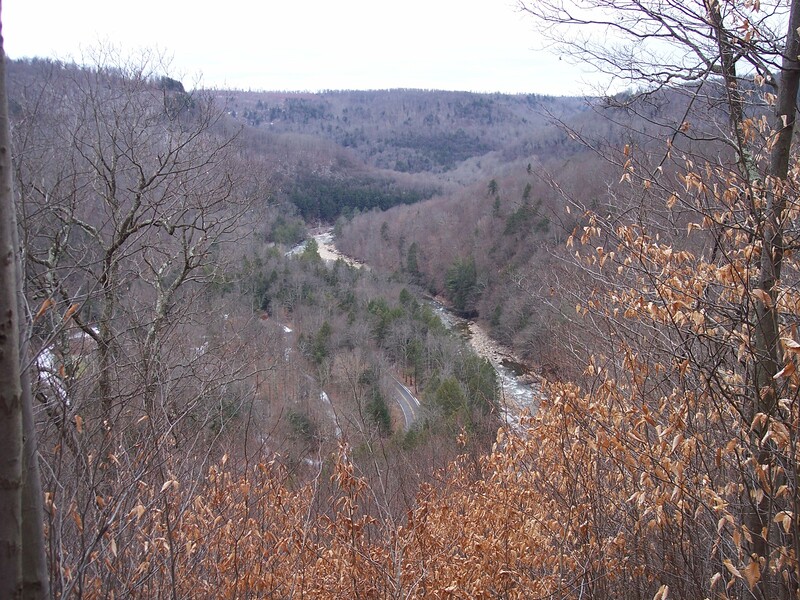 We climbed up along the trail, high above the roar of the rapids in the Loyalsock Creek. 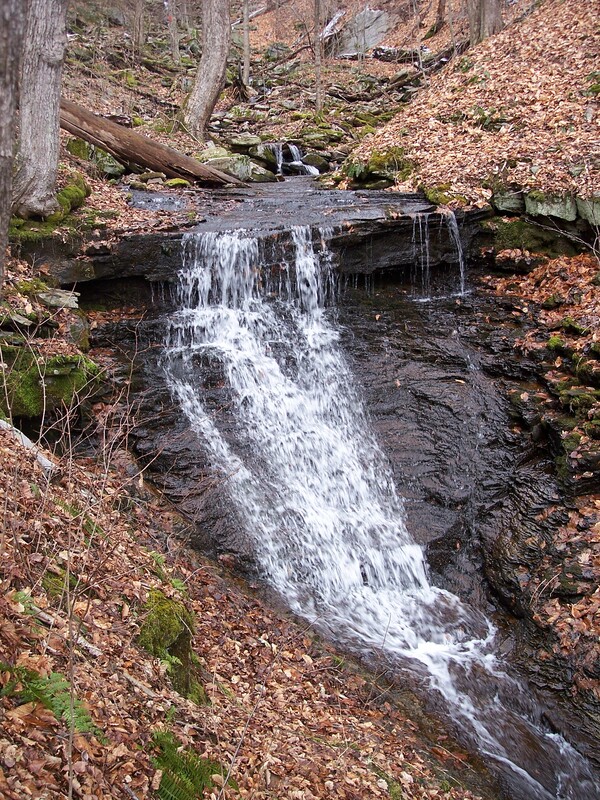 We entered the side glen of Butternut Run with its many small waterfalls and cascades. The Butternut Trail is now blazed with red rectangular placards. The trail switchbacked up a talus slope and soon reached a nice view looking down the Loyalsock into the state park. We continued down the trail and soon reach a sign pointing to a trail that ascends to Loyalsock Road. We took it as it climbed the plateau under birch, beech, and oak trees; it has some faded red blazes. The ground was covered with a layer of powdered snow; you could see white on the north facing slopes in the canyon. The trail ended at the road, on which we turned right and walked for about a half mile. A right turn on the Loyalsock Trail followed as it descended to a meadow and tunneled under hemlocks before crossing Big Run. I love this section of the trail, the forests and creeks are so beautiful. Our goal was Alpine Falls. The trail followed an old grade above Big Run and passes a narrow view, called Ken’s Window. We climbed over the ridge and back down under large hemlocks. We soon reached Alpine Falls as it tumbled down through a rocky grotto. The falls were beautiful as icicles laced the cliffs to the left. The sun came out and illuminated the gorge as patches of blue began to spread between the rolling gray clouds. On the way back, I decided to check out a little-known falls, downstream of Alpine Falls, and off of the trail. It was a tough scramble as I balanced myself along boulders and frosted moss. I peered down 20 feet into a crystal clear pool and saw brook trout scurrying to thier hiding spots. I soon reached the bottom and took pictures of the falls as it bounced down between boulders. It was getting late and we had to head back. We followed the Loyalsock Trail back through more beautiful forests; it seems the hemlocks growing here are mostly healthy. The trail descended along High Rock Run with its many small cascades and we soon reached High Rock Vista just after the sun had set. We continued on the High Rock Trail and reached the bridge into the park. 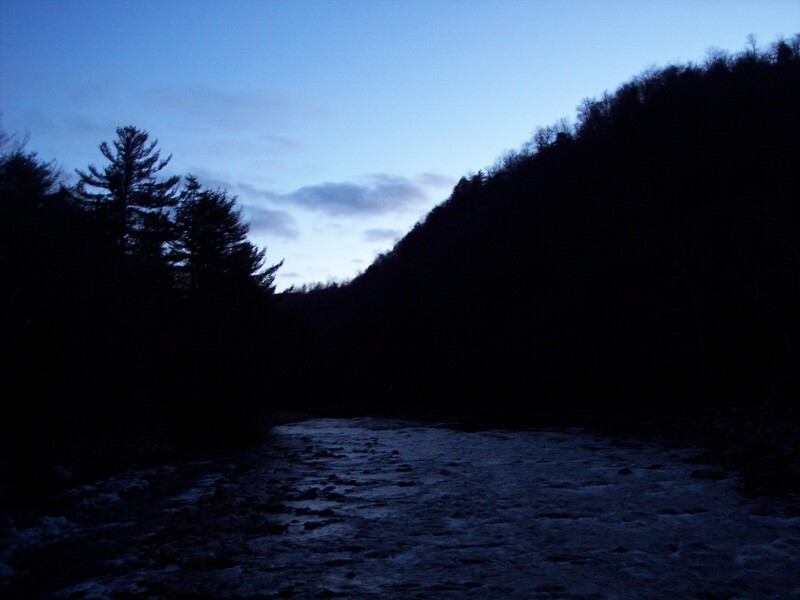 The Loyalsock Creek roared through the twilight as more, and smaller, landslides scarred the canyon walls. We walked along the banks of the creek, were huge mouds of cobblestones and sand were pushed up. High Rock cliff was stained with spring water dripping down its face and High Rock Falls announced its presence through the fading light. As we crossed the bridge back to the car, the creek reflected what little light was left as Venus and the curving blade of a crescent moon rose over the mountains. We got into the car and headed into Forksville looking for a place to eat. A few evenings ago I was putting up a bluebird house and splitting some wood as the sun began to set. The sun shone across the valley to light up the ridge across from my house. 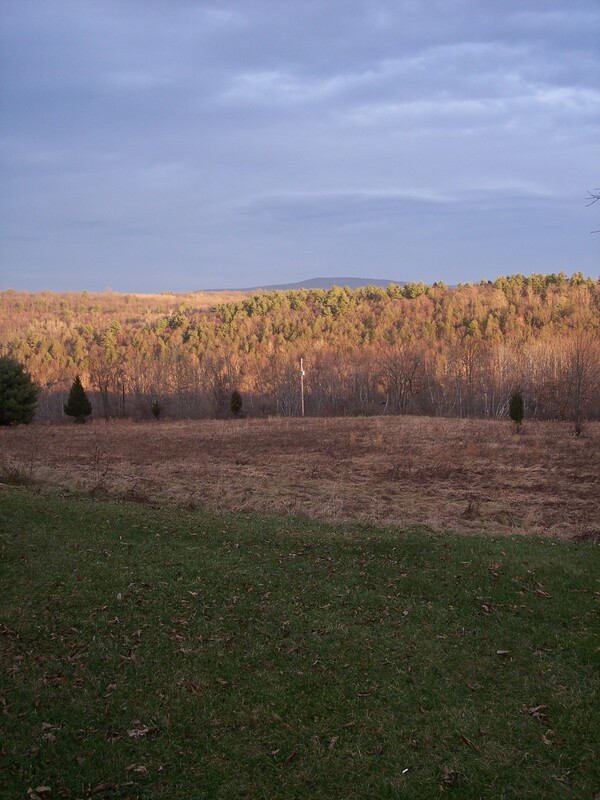 In the distance, Bald Mountain was clothed in shadows under a sky of gray and white clouds. As the sun set futher, the clouds were tinged with pink and red. I wondered what the view must’ve been like from the top of that mountain, as the sun set over the distant plateaus, sending shafts of light across the horizon and painting the Susquehanna River silver and slate, deep in the valleys below. I once climbed Bald Mountain, many years ago. 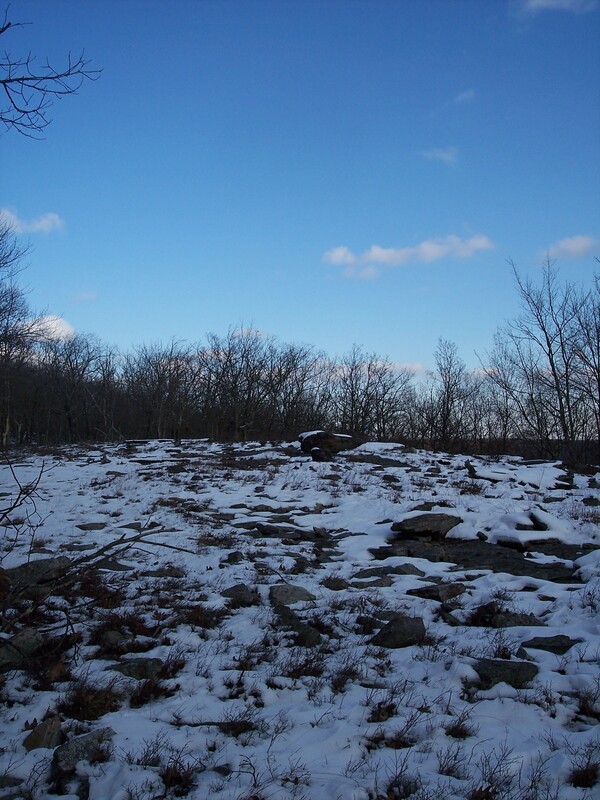 It’s summit is covered with miniature oak trees and lowbush blueberries. There is also a praecipe of cliffs above talus slopes, revealing some of the finest views I have ever seen. Someday I hope to climb that mountain again. Until then, I have to be satisifed with the view from down below, which can be just as rewarding. Winter is gradually making its move. Today, with overcast skies and flurries in the air, I set off into the depths of State Game Lands 13 to scout some routes for the proposed Endless Mountains Trail. I took PA 87 from Mehoopany and proceeded over the mountain at Colley, taking narrow, winding, and dirt township roads. I had to go this way because the bridge over the Loyalsock Creek in Lopez was completely obliterated by the September floods. I reached the game lands and to my surprise the roads were still open; they will be gated in mid-January. I drove and parked at the bridge over Ellis Run. The route of the trail will follow Ellis Run. This creek was encased with thick brush, so I followed an old grade and eventually reached the creek, which was crystal clear. I headed downstream and entered a valley with huge ledges, boulders, and cliffs off to the left, or west. The brush was still thick in places, but deer paths made it easier to walk. Soon the creek entered a deep hemlock forest that almost seemed haunted with numerous, twisted branches. I have never seen hemlocks grow like that. I continued downstream under the cloak of hemlocks as boulders crowded the creek. Ellis Run is beautiful. 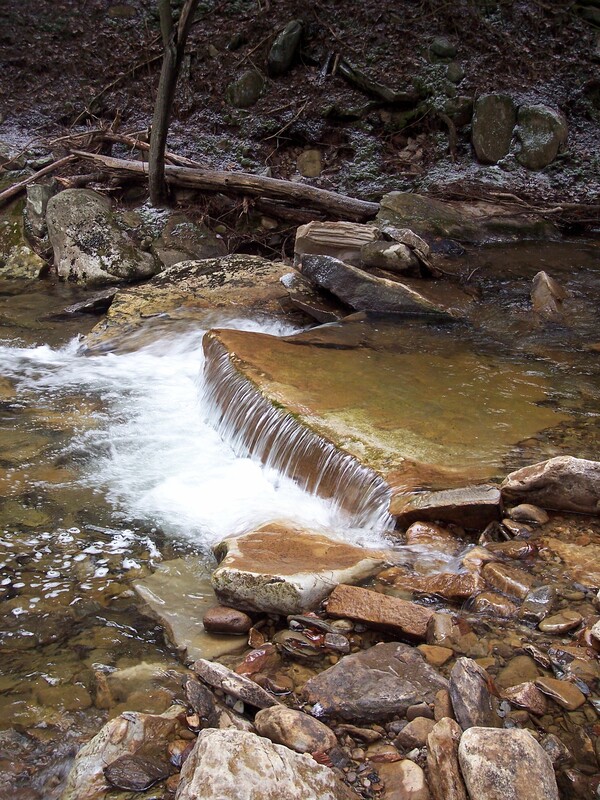 There are no waterfalls, but many rapids and pools in a valley with large outcrops and boulders. There is plenty of space for a trail and no need for it to cross the creek. I reached the swift flowing Loyalsock Creek. I decided to return via the road I drove in on, so I hopped from rock to rock across the creek. These rocks shifted as I stepped on them; they had not settled since the floods. 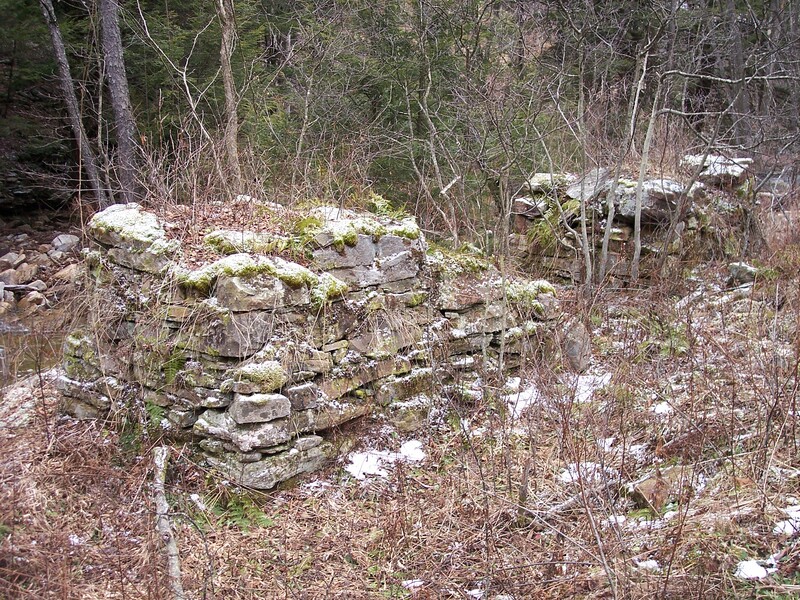 I began to walk away from Ellis Run when I turned right and noticed some odd stone ruins near the creek. I headed back down to inspect them, I had never seen ruins like this. This was clearly not for a cabin, as the stone structures were over five feet thick; it appears they supported something, maybe for some structure during the logging era. I returned to my car and drove down the road. My next destination was Lopez Pond. I found a place to park and followed an old grassy forest road through the forest, passing a turkey hunter along the way. 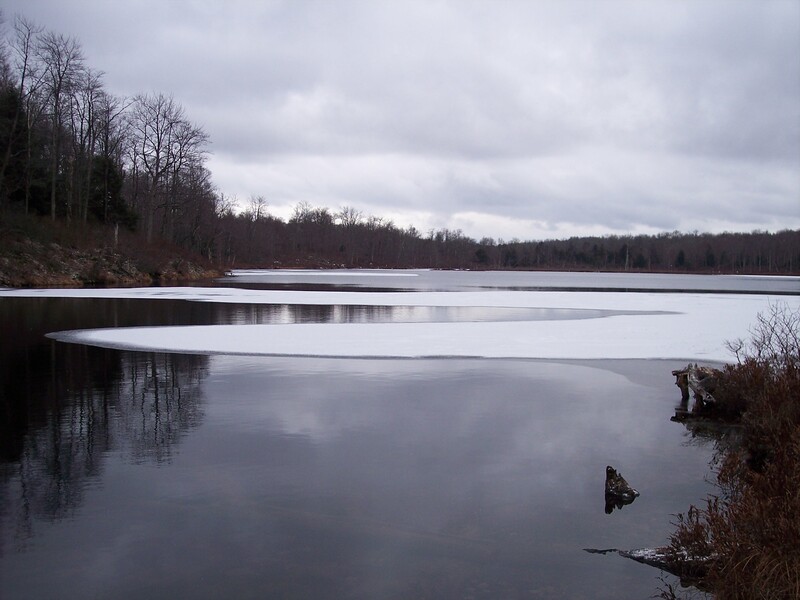 I soon reached this serene, beautiful pond, as meandering contours of ice covered the surface. A beaver dam was at its outlet. 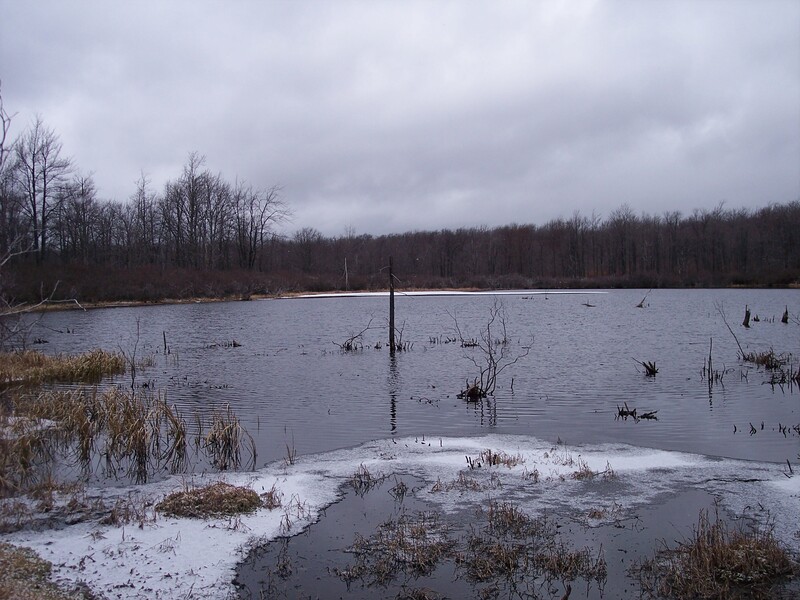 It is anticipated the Endless Mountains Trail will pass this pond. I took some pictures as the flurries began to fall and hiked back to my car. My goal was a different pond, what I call the Hidden Pond. To my knowledge, no road or trail leads to it and I hope to include it along the Endless Mountains Trail. I found its outlet stream, and an old ATV trail, which I followed until it disappeared. I headed south and into thick blueberry bushes until I found the stream again. I continued southeast until I reached the Hidden Pond. The pond is about 5 acres and surrounded by blueberry bushes. This is the place to be in summer when the berries ripen. I was glad to finally locate the Hidden Pond, but it was getting dark and I still had several miles of mountain roads to drive. I retraced my steps as ravens flew silently above the trees in the clouds of snowflakes. I reached my car and headed home. It was great to see several places I haven’t been to before, and that few others have seen. 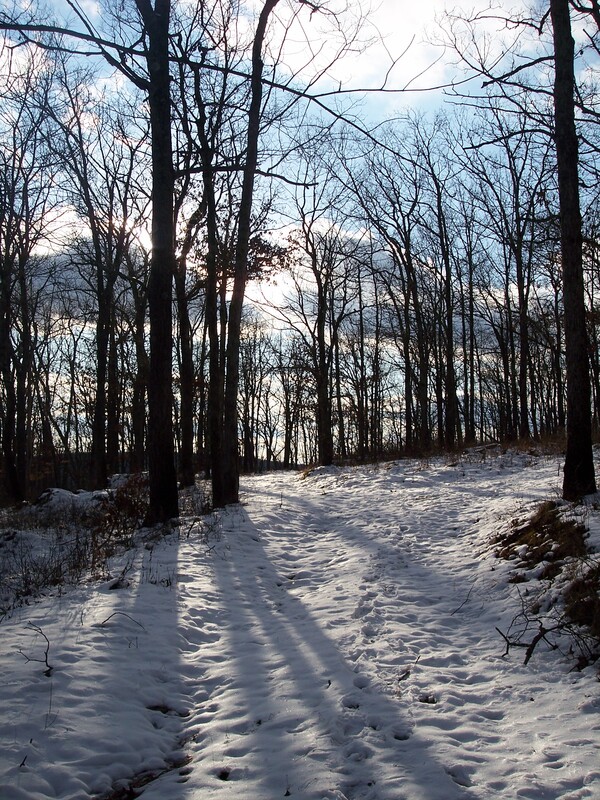 Lackawanna State Park is a great place to hike. Over the years, a profusion of trails have been built, mostly by mountain bikers, that explore every corner of the park. Today, it was crystal clear and cold, revealing deep blue skies. 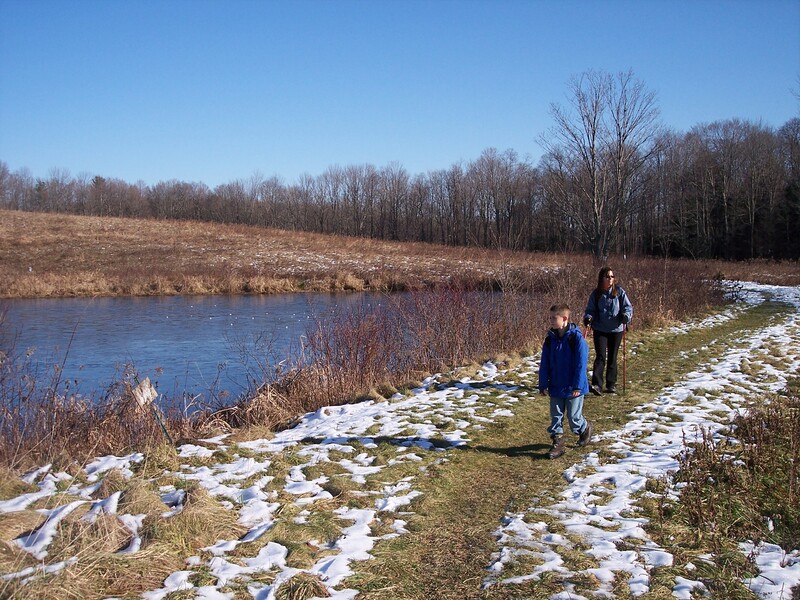 I took Leigh Ann and Christian for a hike in the park, and began on the Orchard Trail. This is a fun trail as it crosses over small streams with several views of the partially frozen lake. We also passed the trail’s namesake: several old, twisted apple trees. Christian was more interested in smashing any ice he could find and bombing it on the lake with rocks. We reached a road where we saw some kayakers on the lake. 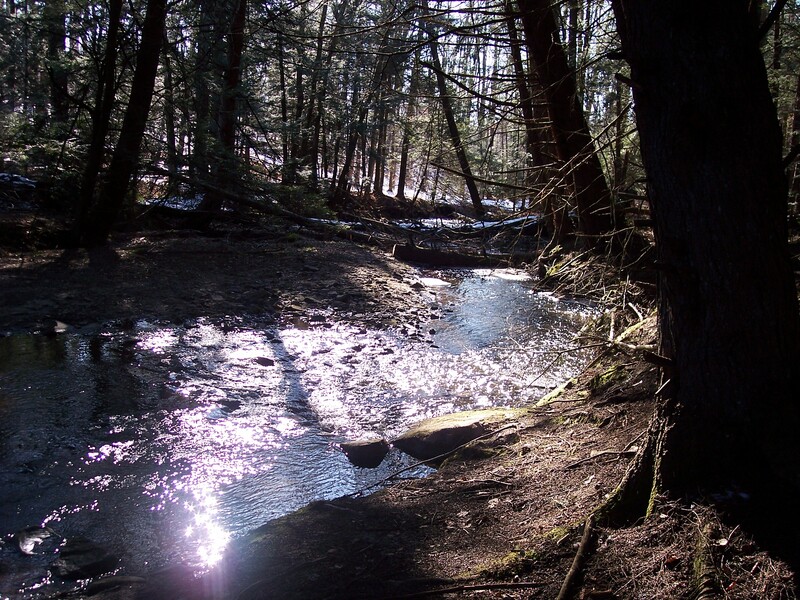 We then followed a trail along Whites Creek into a thick hemlock forest as sunlight sparkled across the pools. Here we crossed on a moss covered, floating hemlock log. While Leigh Ann and I were satisfied with one crossing, Christian had to try it three times. We crossed a meadow and reached Trostle Pond, which is open for youth fishing and was added to the state park thanks to the Countryside Conservancy (http://www.countrysideconservancy.org/). Christian continued his war on ice, by fighting ice with… ice. He threw ice and snow on the frozen surface, which created an odd whistling sound as it skidded. 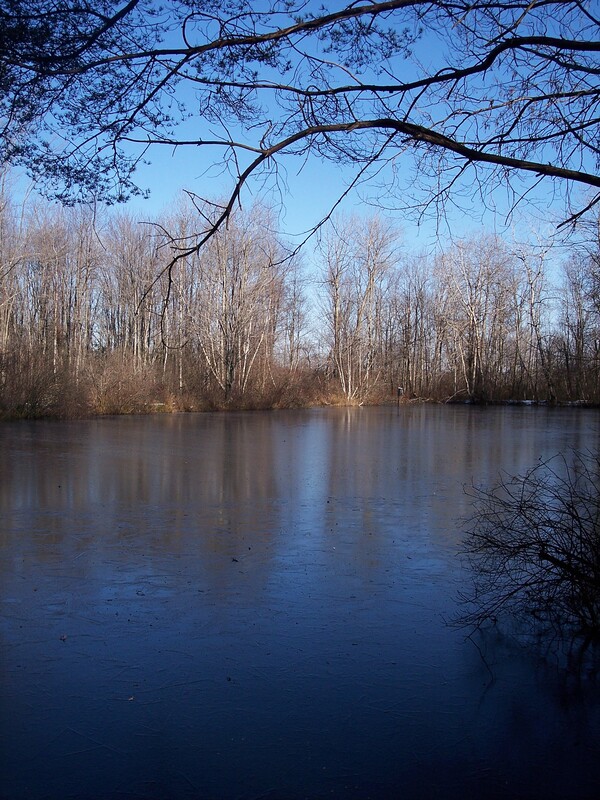 Trostle Pond after being attacked by Christian. The pond won. We decided to take a shortcut back to the car. Along the way I thought we should check out Big Bass Pond, one of two ponds hidden in the interior of the park. Once again, Christian re-ignited is war on ice by piercing it with our hiking poles and threw a tree branch into the pond, which simply planted itself in the ice- half in the water, the other half sticking out. The ice was mocking Christian. We made our way back to Lake Lackawanna through hemlock forests and open meadows with a profusion of deer tracks. 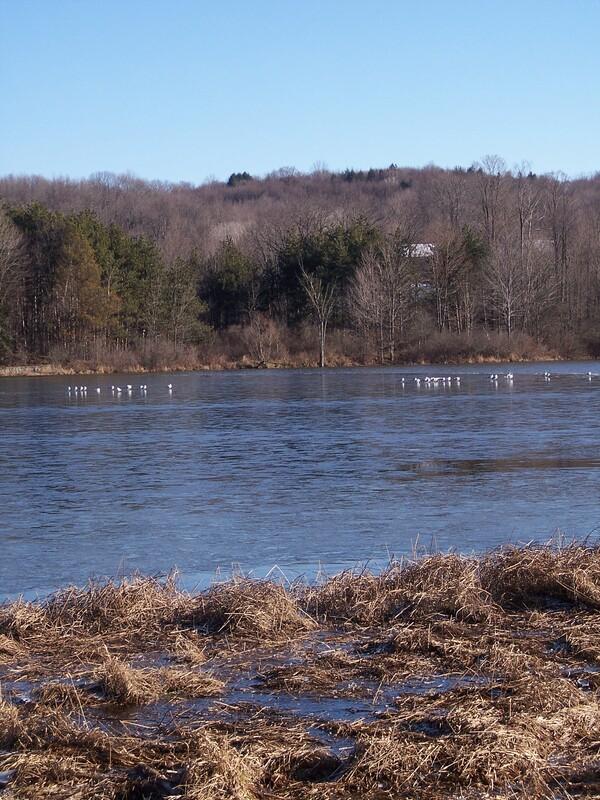 When we reached the lake, there were dozens of seagulls encamped on the ice, glowing white in the sun. They preferred the ice to the open water. We soon reached the car, but not before Christian made one more attempt to defeat the ice with the biggest rocks he had yet to employ. The ice wasn’t having any of it. The ice simply consumed the rocks as flat, silver bubbles of air wandered below the frozen surface. His last barrage from the bridge fared even worse- there was no ice. So he settled for trying to hit a seagull feather in the water. All in all, a good hike. 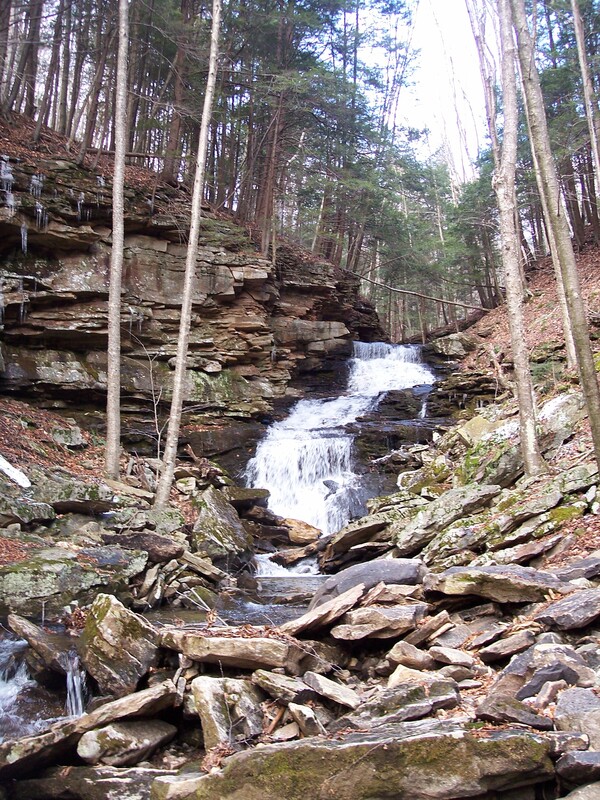 This weekend I visited the Bear Creek Preserve, located about 6.5 miles south of Bear Creek Village, along PA 115. It was a chilly, sunny day as the sun shone between puffy cumulus clouds. I began on a trail marked with red circular placards. The forest is mostly oak with an understory of teaberry or lowbush blueberry. There was even some evidence of forest fires. The trails are all old forest roads. A crust of a few inches of snow covered the ground. My goal was to check out two lookouts marked on the trail map. Other blazed trails intersected with the red trail, they were blazed yellow or green; there were no trail signs. It was a little hard to determine where I was on the map, since there were no trail signs or names. I hiked between some large rock ledges and through open, snowy forests. I was actually covering more ground than I expected when I reached the western end of the trail system. Here I turned left on a yellow trail which dropped down to a level area above the Francis Walter Reservoir, which you could see through the trees. 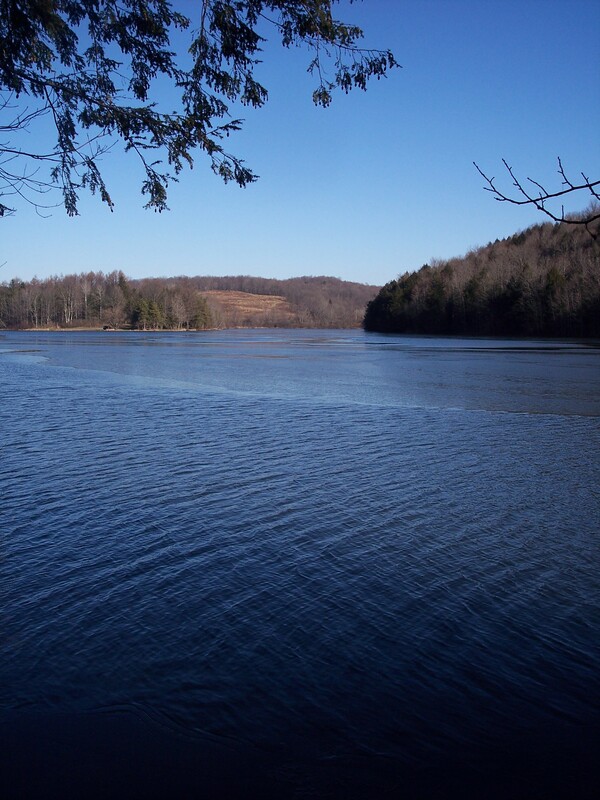 The reservoir was drawn down, revealing frost-covered meadows through which the blue Lehigh River meandered. In the distance, there was snow being made on Jack Frost Mountain, as clouds of it drifted off. I reached an unblazed trail which I determined led to one of the lookouts. I followed it along exposed ledges, but it didn’t lead to any lookout, just no trespassing signs. The good news was that there was a small creek with some cascades. I made my way back, following the yellow trail. I decided to hike to the other lookout, but I met the same fate- a no trespassing sign, and no view. I began to loop back and decided to check out the bog, which was frozen with a skin of ice. It was larger than I expected, with lots of open water. I soon returned to my car. Overall, it was a nice hike, although the trail map could be more accurate. Hikers would be more interested in this preserve if the trails were better marked and signed, and if they offered more diverse scenery, such as more creeks. It looks to be a good trail system for mountain biking, but I do not know if that is allowed. The website says more trails will be added in the future.